GAZA CITY (Ma’an) — Palestinian Minister of Public Works and Housing, Mufid al-Hasayneh, said that recent Israeli airstrikes on the besieged Gaza Strip left 30 residential structures completely destroyed, and at least 500 other others partially damaged.Hasayneh said, in a statement, that the ministry’s engineers and technicians counted the damages and reopen roads closed by rubble. 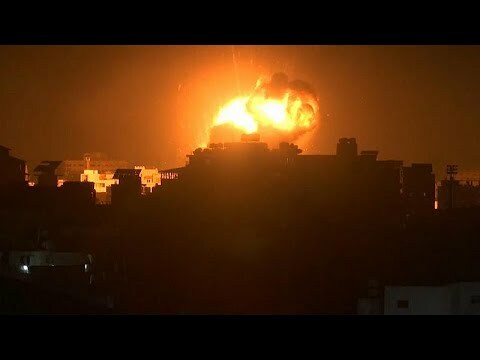 The Palestinian Center for Human Rights reported that dozens of Palestinians were forced to evacuate their homes due to Israeli airstrikes carried out across the Gaza Strip.The center said that 13 families of 70 members, including 44 children and 14 women, were left homeless. Four of the families, of 29 members, were forced to evacuate their homes following airstrikes targeting an insurance company’s office located in the first floor of a residential building.The center warned that the Israeli military escalation against the Gaza Strip would cause the already-difficult humanitarian conditions in Gaza to deteriorate.Israeli warplanes continued to carry out a series of airstrikes overnight on Tuesday targeting dozens of Hamas movement sites in the southern Gaza Strip, despite a ceasefire agreement. The Gaza Strip has suffered under an Israeli military blockade since 2007, when Hamas became the de facto ruling party in the territory.Residents of Gaza suffer from high unemployment and poverty rates, as well as the consequences of three devastating wars with Israel since 2008. The UN has warned that the besieged Palestinian territory could become “uninhabitable” by 2020, as its 1.8 million residents remain in dire poverty due to the nearly decade-long Israeli blockade that has crippled the economy.Residents have continued to experience trauma in their daily lives following the 2014 Israeli offensive, as reconstruction efforts have moved at a glacial pace and with some 65,000 Palestinians still displaced after losing their homes in 2014.